Aufgabe der Stadtentwicklung ist die städtebauliche Planung und Entwicklung der Stadt bzw. der Quartiere mit ihren räumlichen und sozialen Strukturen. Sie schafft damit die planungsrechtlichen Voraussetzungen für die bauliche Entwicklung der Stadt und die Fortentwicklung der städtischen Infrastruktur. Wir möchten Ihnen einen Einblick geben in die Arbeit des Stadtentwicklungsamtes sowie in die Aufgaben des begleitenden Ausschusses. Dabei werden die gesetzlichen Grundlagen und planerischen Instrumente vorgestellt. Einzelne Fallbeispiele sollen Ihnen einen anschaulichen Einstieg möglich machen. Teilnahmegebühr: 15,- € (Mitglieder und ermäßigt 10,- €). Wir bitten um die Überweisung des Teilnahmebeitrags. Eine Anmeldung ist erforderlich. Bildungswerk für Alternative Kommunalpolitik (BiwAK) e.V. Sebastianstraße 21, 10179 Berlin. Wenn Sie Informationen über Veranstaltungen von BiwAK e.V. nicht mehr erhalten wollen, schicken Sie uns bitte eine E-Mail an info@biwak-ev.de. The event was small, maybe a lack of advertizing, maybe it was not well formulated what it is about. Maike and Lars will discuss this with Frans this week. A documentation of the evening and the results of the discussion at the tables will follow soon. we are considering to found a co-ordination and consulting business for housing corporations/ housing associations/ clinics and other private urban spaces that could be used for urban farming. The location was great, nice atmosphere and some snacks and drinks to make it an event people want to stay at. Prepration was very little work (ca. 15 Minutes) and cheap (5 Euros in materials +four existing tables and chairs) which makes it easy to run this format. As the format is very flexible one doesn’t need to know how many people will show up, anything between 5 and 50 can be accomodated for a productive meeting. We had printed out the preliminary work to show the process that this was supposed to be the final event to. This we could have skipped as noone will stand to read 16 pages stuck to the wall. We had set up two tables with two topics each (with questions already written down on them) for people to sit at and chat about them in an open but slightly pre-structured discussion. As there were not that many people the one group talked about all four topics. 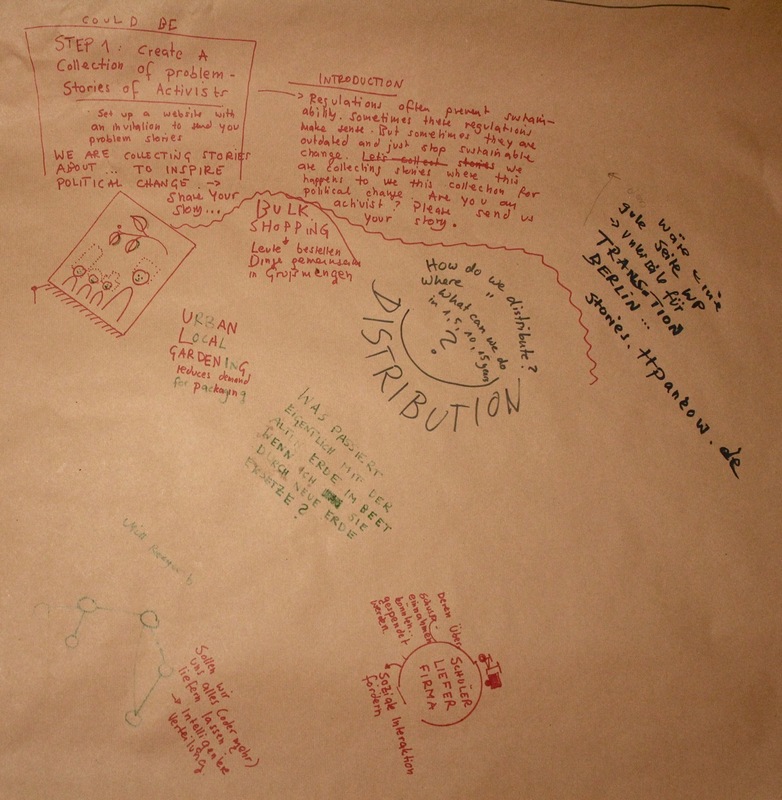 It always works well to have paper on the table for documentation and doodling. There was also space for an ‘open greeting zone’ and scrap paper for people to exchange notes and adresses. Had there been more participants this may have worked well, this way we couldn’t test how people would behave. Experience from the Baumhaus shows though, that it works well to have a zone where it is an accepted and desired social behaviour to approach anyone, introduce yourself and ask them what they’re doing and why they came. How do we grow things? Where do we grow things? Where do we start in 1, 5, 10, 15 years? Can Apps optimize the production? Urban gardening business? Which legal difficulties do we face to establish them? How can we create trust in them? Domäne Dahlem -> museum for the history of food safety -> which laws do we need to keep and which are in the way of more sustainable production? How do we distribute food (fairly)? Where do we distribute food? What can we do in 1,5,10, 15 years? What happens in the old soil in my patch when I replace it with new soil? Could be: Step 1: create a collection of problem stories of activists/ set up a website with an invitation to send your probem stories/ We are collecting stories about … to inspire political change -> share your story // ->Introduction: regulations often prevent sustainability. But sometimes they are outdated and just stop sustainable change. We are collecting stories where this happens to use this collection for political change. are you an activist? Please send your story. How can we recycle ALL nutrients (not just food waste)? Where do we recycle the nutrients? How can we start in 1,5,10,15? 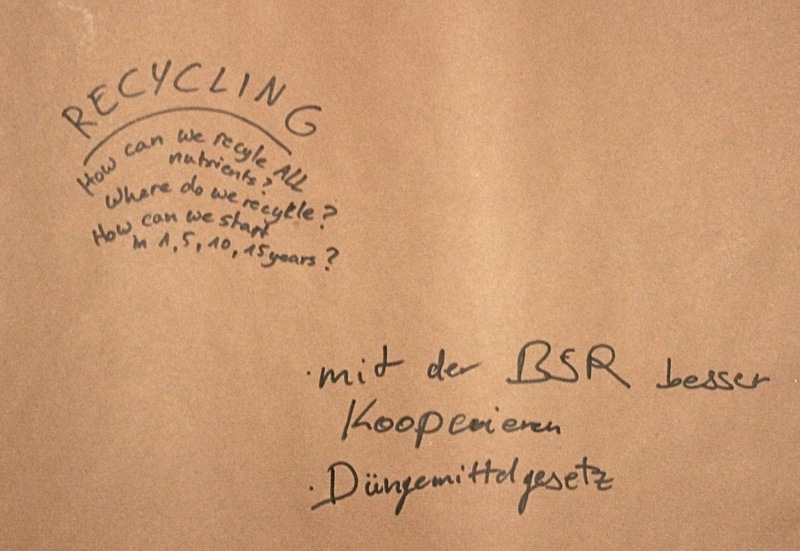 Cooperate better with the BSR (public Berlin waste management company)? There was one girl who is currently working with her team to develop a worm composting box furniture piece (making it a nice thing to have in you household, like a bench to sit on). Sadly she had to leave early so we couldn’t get more comments on the nutrient recycling part. What do we need to teach and learn? Who do we need to teach and learn from? Where do we teach and learn? How do we start in 1,5,10,15 years? Dragon dreaming/ future scenario or other dream workshop format (in the Mauergarten community garden, mauergarten.net) -> which options do we have for the future? We need to dare to look further ahead. 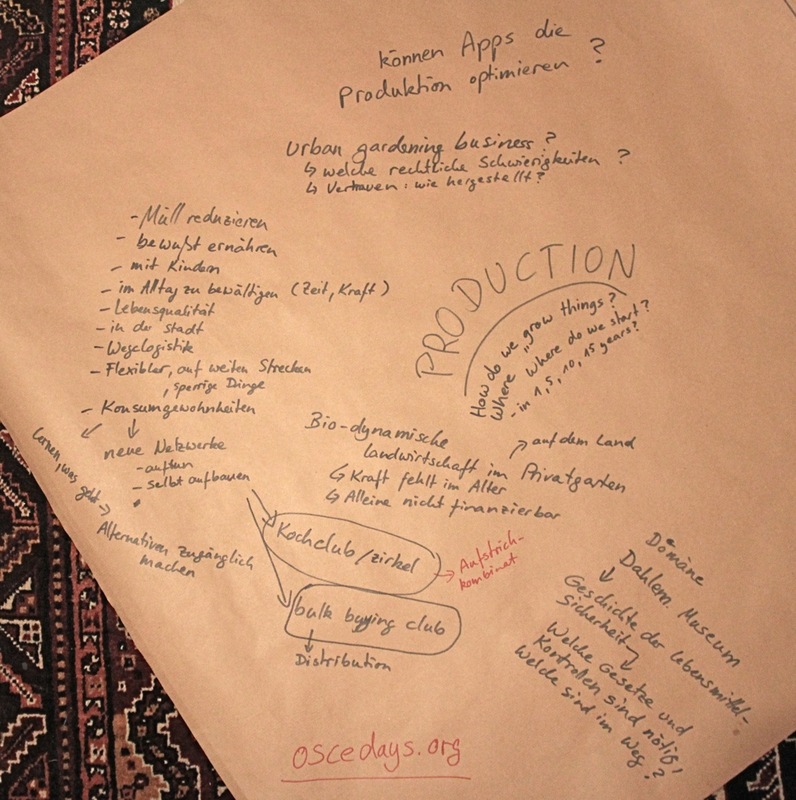 Pioneers do projects: how do we find thos-> who show that a different approach is possible? Use networks. -> hub for information -> using media actively/ low threshold (barrier free) for any kind of user. Collect and publicize blogs on sustainable food. Create events for direct exchange. 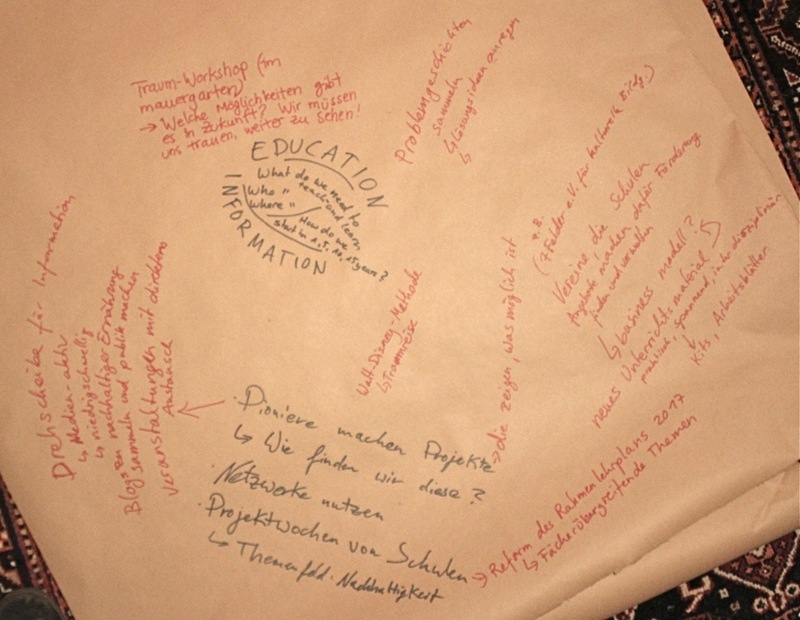 Project weeks at school (common format in German schools: the kids work on the same topic in all school subjects for one week)-> thematic field: sustainability -> for 2017 there will be a reform of the core curriculum for Berlin schools with mulit/interdisciplinary topics, one of them being sustainability. Collect problem stories to stimulate ideas for solutions: ask pioneers: what do you do? what do you want to do in the future? What hinders you to do you work better, realize your dreams and plans for the future and/ or reach your goals? What would need to change to enable you to reach your goals? Which policies need to change to help you in your work? @Lars2i and @Clemens: you were there, please add and correct. @Lars2i: you have some pictures from the event itself, please post 1-2 of them here. @Clemens and @transitionmaike sent out mails to all the ‘edible cities’ in Germany inviting them to edit their own entries in the collaborative document Clemes created after his initiatl research: https://ethercalc.org/deutschland-essbare-staedte . This way it can be kept up to date in the future without anyone being in charge. The response was very positive, one created a map from it and suggested creating a website, another suggested organizing an offline-meeting, and quite a few responded by updating their data. This may be the start of a more coordinated and networked ‘edible city’ movement. The impulse seems to be there, let’s see what 2017 will bring. You know, my friend also works on a project for urban gardening, permaculture, education and vermicomposting in St.Petersburg. Now they got a territory opened for everyone where they grow vegetables according to permaculture principles. If you may need some information about vermicomposting and permaculture I may ask to make a call with you with translation. Also I remember there is a good online in coursera called “Municipal Solid waste management in developing countries”. Even the focus of the course is on the developing countries, they look closely at different ways of organic waste treatment and management. Hi, thanks for the offer, I may get back to it once I start getting this year’s OSCEdays circular sanitation topic together. Currently I’m busy with giving talks on Microfinance in the Philippines, but I did make some interesting connections to development projects that need integrated toilet-energy solutions. Let’s see what the BoSt says about my ideas on that. We’ll now contact all the ‘edible cities’ in Germany that responded to our first call to update their information in the ethercalc-table and ask them to add, edit and review the article. Together we should be able to create a good text that can then be kept updated by anyone. Na da bin ick ja ma jespannt, ob ditt erhalten bleibt mit den Exklusionisten (auch genannt ‘Löschnaz…’) in der Überzahl in der deutschen Wikipedia. Update: Oh, das ging ja wie erwartet sehr schnell. Der Löschantrag ist schon angebracht. Ja, aber es gibt auch schon Gegenstimmen. Ich setze mich morgen nochmal dran. so far so good, noch ist der Eintrag da. some ‘edible cities’ responded, all were in favour of the initiative to have a Wikipedia entry. Some offered to help improve the article. It’s a good start. Lars thread has brought a new participant onboard, we’re currently discussing options for such a business. The Wikipedia entry made it through! Edible cities is now an offically encyclopedic term. Plus we got in touch with other edible cities, namely Kassel and Andernach. Friday is the last event of the ‘Klimagärten’-Series. Maike wants to attend it to do some more networking. we have unsuccessfully tried to get involved with the local government in Pankow. as they were non-responsive to our mails we filed an official request to the local council, the reply was somewhat sad: they claim to have no capacities to even look into the matter. the food council has contacted several other districts in berlin that claim to be edible with a similar result: none of them seriously plan to do more than planting a few trees and bushes in public space. It seems as if Berlin food policy still has a very long way to go. Update 2019: We made really good progress! the event on “Edible City” in collaboration with the Forum Stadtgärtnern took place in September 2017 and was a great success. http://stadtmachtsatt.de/ is currently doing the project “Wandelnde Bäume” with school kids in Berlin. Young trees are planted in mobile containers that have a bench on each side to encourage satying with them. The children can move them, e.g. for art performaces or demonstartions in public spaces, and will take care of them until they have grown enough to be planted in the city. (sadly no documentation published yet, but it looks really cool!). Maike is planning on developing and building a “Juice Making Cycle” including machines for making juice that are tansportable and usable with school children, a Cyceloo-type pop-up composting toilet, a mobile compost heap, a mobile apple tree, and a micro-methanizer for producing the cooking gas for the pasteurization. That way she hopes to make the food cycle visible, from apple tree to juice through the human body back to the soil and the tree. The goal is to let people (teachers, parents and children alike) experience how they are part of the ecosystem and interlinked with the environment: Protecting nature is directly linked to caring for oneself, right now and right here.